Good day from Augusta. Gov. Janet Mills is expected to release her two-year budget proposal on Friday, when it’s due to the Maine Legislature. It will mark the earnest beginning of policymaking in the 2019 legislative session, which has been sleepy during the first month. Mills, a Democrat, has marked that period by ramping up Medicaid expansionto the first 3,000 recipients and installing 13 of her 14 commissioner nominees so far and taking initial steps to combat the state’s opioid crisis. But the budget, which must be approved by two-thirds votes in both chambers under normal circumstances, will be a tougher task. After eight years under Gov. Paul LePage and a national wave of Democratic opposition to President Donald Trump, there is pent-up demand among liberals for a progressive course change that Mills — a wonkish, centrist Democrat by heart — is only embracing to a point. Early budget discussion has revolved around Mills’ no-tax increase pledge and her desire to spend more on education, health care and tax relief. The governor has said less about her budget proposal in recent weeks after she said publicly in early January that it could be released before the due date. LePage released his last one with an hour and a half to spare. The Friday budget release will come before Mills’ scheduled address — which takes the place of the State of the State speech in a governor’s first term — on Monday. It will flesh out Mills’ policy goals after what has largely been a three-month honeymoon period with Democrats. That may change. Mills promised in her campaign she wouldn’t raise taxes. Progressives have only pushed her a bit so far. 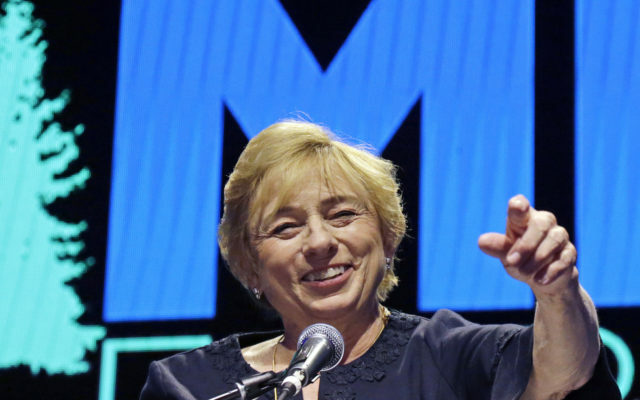 The Maine Center for Economic Policy released a budget framework calling for spending $782 million more over two years with a $518 million tax increase Mills ruled out that would be paid by people who earn more than $100,000. The framework is aggressive, but it illustrated the fiscal hurdles that lawmakers will have to jump to fund three key initiatives — $320 million to fund a never-met threshold of 55 percent of essential K-12 education costs, $219 million to restore municipal revenue sharing and $110 million for Medicaid expansion. While Mills wants to provide more funding in all of these areas, her budget may have to partially move in this direction without new taxes. Mills has championed an aggressive education agenda that hasn’t been fleshed out yet, but she has said that increasing education funding, universal pre-K and raising minimum teacher salaries are priorities. She has also vowed to propose a long-term funding mechanism for Medicaid expansion and prioritize property tax relief. The Legislature — led by Democrats who will have to negotiate with Republicans — will have the final say on the budget. But it’s looking as if Mills will build toward fully funding these items rather than doing them all at once. The State House schedule is full today. It starts with an 8:30 a.m. sexual harassment prevention training for lobbyists, followed by floor sessions of the House of Representatives and Senate at 10 a.m. Schedules for most of the nine legislative committees to meet today are stacked with public hearings on referred bills and work sessions. Among those bills is LD 477 from Senate President Troy Jackson, D-Allagash, a piece of emergency legislation designed to financially support federal workers during another federal government shutdown. With the possibility of another partial government closure looming as early as next week, Jackson’s bill would guarantee interest-free loans up to $5,000 for any of the approximately 1,100 federal employees in Maine who will again work without pay or be furloughed. A work session for the bill will begin around 2 p.m. in the Committee on Health Coverage, Insurance and Financial Services meeting. You can listen here. — The governor offered more details on how her administration will address Maine’s opioid crisis. In an executive order signed Wednesday, Mills signaled heightened focus on addiction treatment. The order also allocates $1.6 million to expand access to an overdose antidote and recovery coaches in health care settings. Gordon Smith, Mills’ opioid response director, said the $1.6 million, taken from existing state funding, will be used to buy 35,000 doses of naloxone to distribute throughout the state and train 250 recovery coaches — and install coaches in 10 emergency rooms. Many of the changes that Mills wants to make will require legislation. On Wednesday, she said she is targeting the state’s two-year caps on Medicaid treatment using methadone and suboxone. She has also called for raising Medicaid reimbursement rates for treatment. — Wednesday was a volatile day for Central Maine Power. As state utility regulators threatened to slap the company with a $500,000 fine for billing and other problems, the company and its Canadian partner, Hydro-Quebec, sweetened its package of local benefits in hopes of winning support for a controversial $1 billion plan to build a transmission line through western Maine forests. The sweetened offer includes money to lower rates for low-income Mainers, underwrite environmental programs and boost the state’s fiber optic network, among other incentives. — Upheaval at a small Maine hospital has spurred a citizens group to call for new ownership. A Lakes Region citizens group critical of health care at Bridgton Hospital is asking municipal officials and residents to help it shift control of the hospital from parent Central Maine Healthcare to MaineHealth. The move comes after changes made by Central Maine Healthcare CEO Jeff Brickman to improve the hospital’s troubled financial situation. Brickman said the group seeking new ownership of Bridgton Hospital has not reached out to him and that his organization has not received a formal offer to buy the hospital. One of the more interesting tidbits to emerge from the great “corn syrup in beer” debate ignited by Bud Light commercials during the Super Bowl is that beer has never crossed the lips of Iowa Sen. Chuck Grassley during his 85 years on Earth. “I’ve never tasted beer, but I’m glad that they use the corn as part of their product,” Grassley, an avid advocate for all uses of corn grown in his state, reportedly told reporters Tuesday. Having grown up in a family that called bottle openers “church keys” because of some members’ fervent devotion to the bubbly, fermented elixir, I find this hard to fathom. I pass no judgment on Grassley, but I’m still trying to decide whether going 85 years without at least a sip of beer is a great human achievement or a near-criminal act of self-denial. Family lore holds that my first exposure to beer came when I was about a month old, because it was the only hydrating agent available when my sainted mother had to nurse me during a sweltering August wedding. The “Bobby drank beer as a baby” story changed as my Irish relatives worked it over in the ensuing years, and I remain dubious of its veracity as my mom rarely imbibed anything other than communion wine during the parts of my childhood that I do remember. But I have no memory of that alleged early exposure to lager or ale. Must have been the beer.